Amazon.com is no longer a brazen ecommerce start-up. It has grown into the leading online retailer. And it evolved its platform to provide tools and technologies for other businesses to use. There are so many of these tools, in fact, it’s hard to keep them straight. But I’ll review six of them here to help you decide whether Amazon can benefit your business. You can sell your items directly on Amazon.com utilizing the “Sell on Amazon” program, either as an individual with a small number of items, or as a “Pro Merchant” selling more than 40 items per month. Pro Merchants have access to additional administrative and selling tools, but they pay $39.99 per month, plus a referral fee that’s either a percentage or a fixed amount of each sale. The percentage and fixed amounts vary based on the product category, but the maximum charges are 15 percent and $1.35 per item, respectively. Here is an example of how your product listings might appear on Amazon.com. Sell your own products on Amazon. Pros: Gain exposure; create a new sales channel; get your products in front of Amazon’s vast customer base. Amazon also offers fulfillment services for your products, which I discuss below. Cons: You are competing with Amazon; referral fees will cut into your margins; you will not receive the sales proceeds immediately. If you have a larger product inventory, you will need a little time and technical know-how to keep your product feed working correctly. Also, Amazon does not accept third-party products in all its categories. You can advertise your products on Amazon in two ways: “Product Ads” and “Display Ads.” Both are pay-per-click programs, similar to Google AdWords. This direct PPC model can work better for some merchants than the fees associated with the “Selling on Amazon” program, which involves uploading product images, descriptions, prices and maintaining inventory levels. Here is an Amazon product page showing some Amazon Product Ads. You can buy adds linking to your website. Pros: Relatively low pay-per-click fees; great exposure; generally high conversion rate, based on data I have seen from our customers. Cons: Need some ability to manage PPC; results vary depending on your product category. “Amazon Webstore” is a relatively complete, turnkey ecommerce platform that allows you to set up your own online store. This solution could be enticing for someone getting into ecommerce who does not have a lot of experience or knowledge. Amazon markets Webstore — and its Selling on Amazon service — to encourage merchants to get their products into Amazon’s marketplace. Webstore-only customers pay $24 per month plus 2 percent of sales. Pro Merchants — who already pay $39.95 per month — can use Webstore without the $24 per month fee. Pros: Easy setup; reliable hosting using Amazon’s servers; potential to utilize Amazon’s fulfillment services; easy integration with Amazon’s marketplace. Cons: Limited ecommerce options; unless you have another online store, you are locked into Amazon. You will want to evaluate the level of support that Amazon provides and whether it will satisfy your needs. Whether you use Amazon Webstore or a website on another platform, you can offer “Checkout By Amazon” as a payment option for your customers. Like PayPal or Google Checkout, Checkout By Amazon is a hosted payment option that many consumers trust. Amazon also has a related technology called “PayPhrase” that allows shoppers to enter only a short phrase to complete a transaction — for sites utilizing Checkout By Amazon. Here is an example of Checkout By Amazon on a separate ecommerce site. You can use Checkout By Amazon with your existing platform. Pros: Many consumers trust Amazon’s payment and checkout services; relatively easy front-end site integration. Cons: Could be confusing for non-Amazon-savvy shoppers; Amazon has your customers’ purchasing details. Must integrate the payment processing with your current order processing and workflow. Amazon has developed one of the most sophisticated order fulfillment systems in the world. Smaller merchants can take advantage of this fulfillment technology. To use “Fulfillment by Amazon,” you send your products, in mass, to Amazon’s fulfillment centers. Amazon has developed a complete system for tracking and communicating about your products and orders, whether orders occur on your own site or on Amazon.com. Pros: Leveraging Amazon’s shipping options and delivery infrastructure can be a competitive advantage and allow you to focus on marketing your business. Cons: Need to closely evaluate how much to rely on Amazon, and whether outsourcing fulfillment will enhance or detract from your relationship with your customers. Also, you must decide whether Amazon’s fulfillment pricing works for your business. So far I have addressed services that Amazon targets specifically to online retailers. But, a core part of Amazon’s business revolves around its cloud computing and data storage services. Businesses, large and small, can utilize Amazon’s computer power on a pay-as-you-go basis using “Amazon Web Services,” which is a large suite of hosting and computing services. One of those services, for example, is “Amazon S3” (Simple Storage Service). It allows companies to store files and content on Amazon’s system and pay only when files are accessed and bandwidth is used. S3 makes sense if your ecommerce platform provider charges a premium for disk usage or bandwidth or you have large media files to serve to your customers, such as product demo videos or large images. S3 can also facilitate off-site backup or storage of large amounts of data that does not need to be continuously accessed. 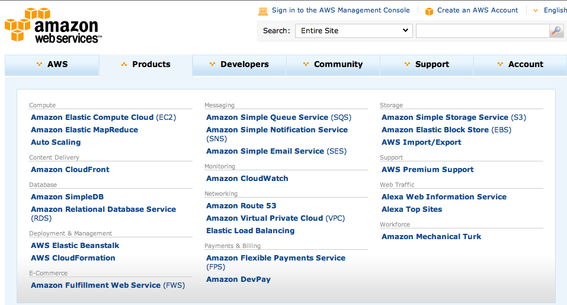 Amazon Web Services is a suite of hosting and computing tools. For many ecommerce merchants, Amazon is a direct competitor. But its site has huge traffic that merchants can market to. And it offers many marketing and technology products that can help smaller merchants grow their businesses.